This summer I'm enrolled in the Culinary Lab: Baking course as part of my graduate program - the Master of Liberal Arts in Gastronomy at Boston University. For 6 weeks I'll be spending 2 nights a week in the professional kitchen learning all about baking. The course requires students to keep a journal of the experience and I've decided to record my adventures here on the blog. I hope you enjoy! You'll get the calorie-free version of my decadent baking experience. Classes 3 and 4 introduced the class to some classic dishes. 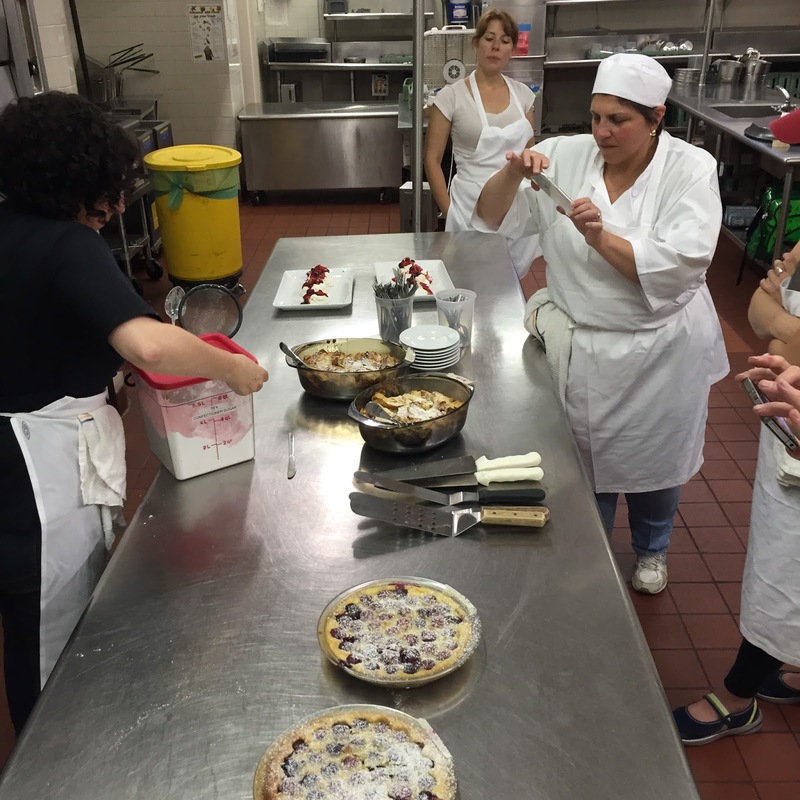 The menu for our third class included Pavlova, clafouti, and almond orange bread pudding. 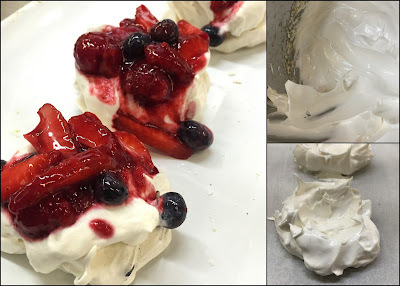 These three recipes provided us with an introduction into the world of custards and meringues. How interestingly different egg yolks and egg whites can be! Before we headed to the kitchen we learned about all the different options for puddings (starch thickened, baked, steamed), custards (stirred or baked), Bavarian cream, mousse and souffles. Similar ingredients - very different results! The Pavlova was first on the prep list. This graceful dessert is named for a ballerina and her signature role as a white swan. These are not a traditional meringue that crumbles when you bite into it. The addition of vinegar makes the inside chewy while the outside is crisp. The whipped egg whites are spread into circles on parchment with a slight well in the center. These don't puff up when baked and the well is the perfect spot to layer in fresh berries with raspberry sauce and fluffy whipped cream. The individual size bakes in half the time and also makes for an elegant presentation. Imagine a summer luncheon with these individual Pavlovas - no one has to share! The next recipe is courtesy of Julia Child, one of the founders of the program at BU. 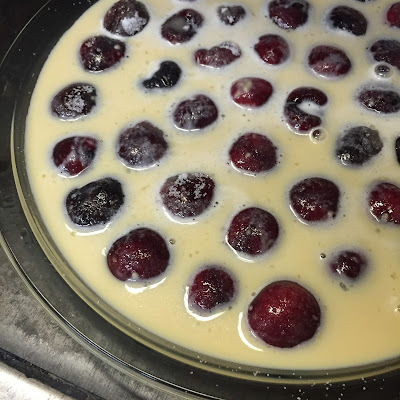 Clafouti is a custard dessert traditionally made with cherries. Custard and fruit are cooked together until it puffs and browns. A sprinkle of powdered sugar is added before serving. The dish is pretty straight forward, but Julia has a great technique that she incorporates. Rather than just dump and bake, she instructs the reader to pour 1/4" of batter in the bottom of a pie plate and hold over moderate heat until the batter has just set. The cherries are set on top before the remainder of the batter is poured in. This prevents the cherries from sticking to the bottom of the dish. Another interesting note - the cherries are added whole (don't serve this to children!). The pits contain a chemical that when baked have the scent of almonds. I have to admit, this one was not my favorite. The soft custardy texture is not my preference. But it was easy to make and would make for a great party dish as it can be served at room temperature. 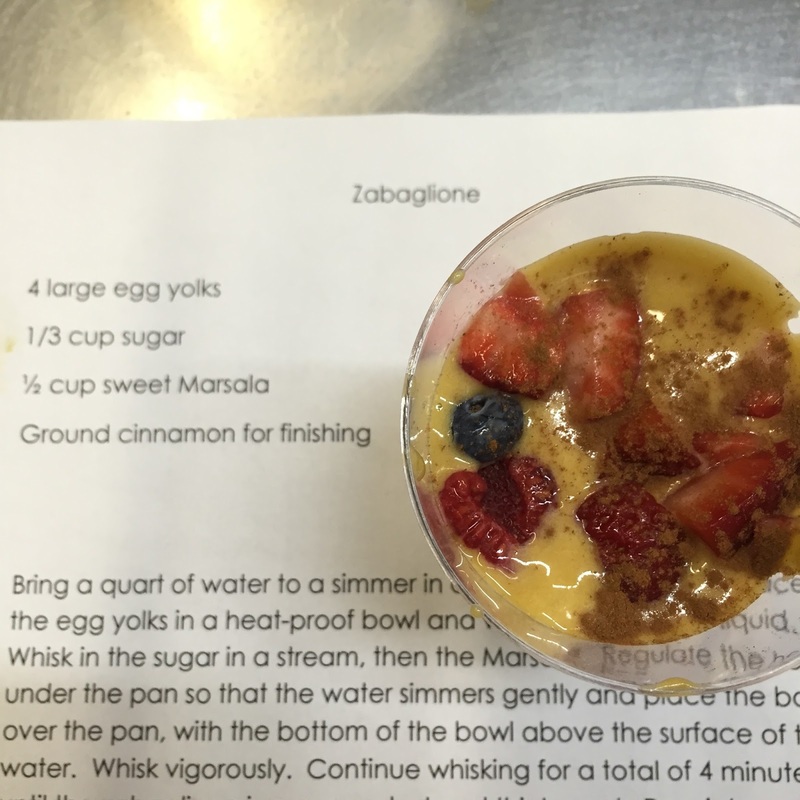 A last minute addition to the night was Zabaglione. We each got a double boiler, egg yolks, sugar, sweet Marsala, and a whisk. Over a slight simmer, we whisked and whisked and whisked until the mixture was aerated and slightly thickened. It took more than the 4 minutes called for in the recipe and I felt the burn! Proper whisking technique is definitely a learned art. Thankfully my eggs didn't scramble and I ended up with a delightfully smooth custard to pour over fresh berries. Here's a look at the group at our end of class tasting. The casserole dishes contain David Leibovitz's recipe for almond orange bread pudding. Pictures and then tasting! 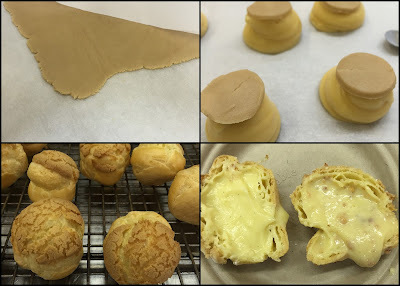 It was hard to contain my excitement over class four - Pate a Choux! This is the base for some really great pastries. 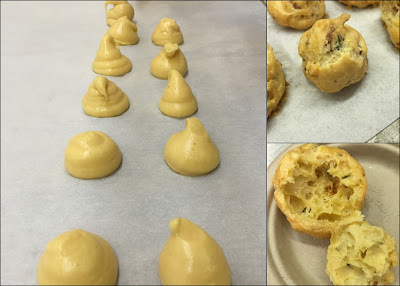 Pate a Choux is one of those things that I thought was going to be a real challenge to make. We used a recipe from Jacques Pepin that was easy to follow and produced fantastic results. We elevated these with a craquelin topping and a generous filling of pastry cream and nougatine. Making Pate a Choux requires a lot of observation. Adjustments have to be made depending on the size of the eggs, the dryness of the flour, or how much the dough dries when you cook it (and even the weather). The beauty of these profiteroles is how the eggs and steam puff them up leaving a perfectly hollow inside waiting to be filled with something creamy. Before we baked them we topped them with craquelin - butter, sugar and flour that is rolled out and cut into circles to top the profiteroles. These bake into a crisp, sugary topping. This reminded me of Japanese melon bread - a delicious airy bread that is topped with a sugar cookie like crust. Now that I made these I see the resemblance and I am inspired to see if I can recreate them. Gougeres are made in a similar way, though these got a dash of bacon, thyme and Gruyere before being piped into adorable little blobs on the baking sheet. They baked up light and fluffy and perfect for any occasion. Knowing that all of these freeze well is dangerous. I might be eating up all my frozen vegetables and filling my freezer with profiteroles and gougeres to have whenever the urge strikes! It is a lot of fun to learn the basics and building blocks of pastry - from the doughs to the pastry creams to even just a good whipped cream. The good news for my family is that I'll have to keep making these so I don't lose the knowledge! What dessert have you always wanted to learn how to make?